How to start a Blog for Beginners Guide? Home Wordpress How to Start a Blog For Beginners Guide? Yes, I know you interested in starting a blog for hobby or for the business purposes. Those days starting a blog was a really complicated process. This post explains to you how to start a blog in a detailed manner. Today starting a blog is not a complicated issue. Due to the web technology advancements starting blogs is really easy. If you have basic knowledge about websites sure you will easily start a blog without knowing anything about a single line of coding. If you don’t know anything about blogging means it is a really confusing process to start a blog for you. After build your blog you need visitor. I will help you to build your audience for your blog in the future post. I will help you build your blog step by step. Please follow the below steps. There are a number of free blogging platforms available today. The famous blogging platforms are WordPress, Blogger, Tumblr and etc. WordPress is one of the top blogging platforms on the internet. There are 72 million active WordPress blogs active users using this platform. The WordPress is easy to build blogging platform. Because it is open source software and also it gives lots of free themes and plugins for users. The WordPress platform has lots of active community users. If you have any doubt about this software you can ask any question on active WordPress forums. Even this simple blog LwebCoupons was built by WordPress CMS. Here’s I listed some points why I choose WordPress for blogging. WordPress is open source software. You can also download lots of free themes and plugins from WordPress repository. If you have known simple things about blogging you can even easily build your first blog using WordPress. WordPress updates their code regularly. WordPress cares about site security to protect from hackers. Lots of big sites use WordPress for their blogging. Some brand names are Sony, University blogs, and NASA blogs are use WordPress. You can find the WordPress Showcase sites here. You can customize WordPress software easily. There are a huge WordPress community members available online. If you want any help you can ask help from WordPress community. Sure they will help you. If you wish you can select other blogging platforms for your site. But I think and most of the people use WordPress platforms for their site. It is really easy and also it has a huge community. So, WordPress is one the best top platform for blogs. Why should you Select Self Hosting blogs? There are many hosted blogging platforms available online. The hosted blogging platforms have many disadvantages. You know many famous bloggers available online but no one use and not recommend hosted blogging platforms to their users. You site address looks very long and hard to remember. You don’t have control over your content. They may shut down their operation anytime and you will lose your content and your audience. Most of the hosted blogs don’t allow your advertisements. They put own ads on your site. They allocate a small amount of memory to your site. If that memory space used they ask extra money for space. If you want to try the blogging for the experience you can try it use the free blogging platform. If you want to promote your business or want earn money using blogging you should use self-hosted blogs. The self-hosted blogs are the best way to reach your business to your customers online. Yes, I sure you decided to start your blog using self-hosted platforms. But you should initially need two things to start your blog on self-hosted platforms. Domain names are the most important part of your business online. It represents your brand online and without your domain name, you can’t get your blog display online. Here in the example above names Google, Facebook and LwebCoupons are domain names, “www represents World Wide Web” and .COM represents Top-level Domains(TLD). There are hundreds of TLDs available that names are .COM, .ORG, .NET and much more. Before start buys your domain name you should know how to choose the best domain name for your business. I listed below some important tips when you register your domain names please consider the below tips. Don’t worry, I will show you below how and where to buy domain names for your business. The web hosting is the simply disk space or hard drive which holds your data, images and text on the disk. You can connect to your online hard drive using the domain name and If that connected you can upload your data to it using special permission. The cost of the web hosting is varying based on your hosting needs. Shared Hosting – is simply single server to host 25 to 100 websites. VPS hosting – It plays in between both shared and Dedicated hosting. It has more control than shared server. Dedicated Hosting – Single server dedicated to one user. There are hundreds of hosting providers available online but all are not made equal. I have very good experience with LiquidWeb they provide all types of hostings and also they provide domain names with 24/7/365 days support. If you interested in LiquidWeb, then find here $250 OFF liquidweb coupon discount for your new web hosting. How to Install WordPress on Liquidweb? In this section I will explain to you how to start a blog using Liquidweb. The Liquidweb is one of the top web hosting providers in the world. They provide all types of hosting plans and you like Managed WordPress hosting plan because you don’t need to do any change in configuration settings. You just go to your site admin URL. The WordPress admin URL looks like this www.yoursitename.com/wp-admin. Go to that above link and put your username and password then login to the dashboard. After login to your WordPress dashboard, you can see the menu on left and top of your admin panel. The WordPress CMS is one of the best software because it is dynamic and you can have the control to change themes and plugins on the WordPress dashboard. 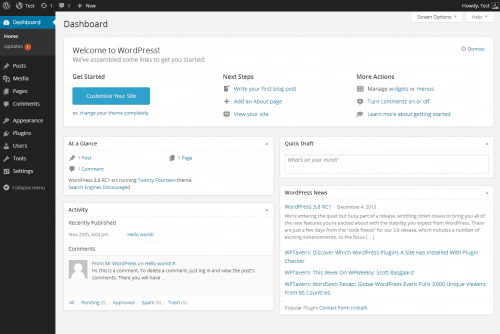 Home – It is a WordPress Home dashboard menu. Post – Use this menu link you can create a blog post on your site. You can use this menu to create and delete a post on your site. Media – It holds all your uploaded images. Pages – Add and delete new pages in this section. Appearance – Use this menu link to upload or install new themes or design on your site and also it used for customizing your site using this link. Plugins – This is a simple program that performs simple tasks at your site. You can add new plugins using install or upload method on this section. Settings – You can change your site title and permalink using this link. There are many setting available in this section. You can refer to using plugin section. How to Add Post On your WordPress site? Next add your post title and content you need to publish it to on your site using publish button. After this process, your post is visible to all of your site visitors. Add your pages using the same above method. How to add Image your post or pages? You can add images on both of the post and page section. Just by click, add media button. In the post and page section, you can see link icon and just click and add your link to it. Simply Go to post or page and click the heading drop down menu. You can see a list of header and you can use it on your page. How to Change Fonts on WordPress blog? When you start using the WordPress blog you will easily understand all the above things. Start a blog is not an easy process if you are in a beginning stage. It looks very confusing process but if you learn enough things you will become good blogger like me. If you really interested in blogging just start now using the above methods and tips. It is worth for you in future. If you have any doubts about how to start a blog tutorial kindly asks your questions using the comment section.I will sure help you for all of your questions.